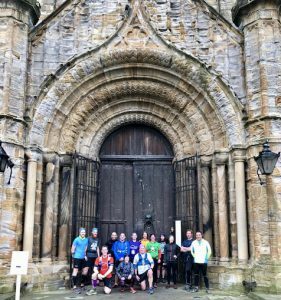 Keen to settle their festive excess debt, a dozen or so Striders met at St Mary and St Cuthbert Parish Church in Chester-le-Street, lured by the promise of a challenging, hilly yet rewarding route – Cuddy’s Corse. I explained at the start how lucky we were not to have to carry the uncorrupted body of Cuthbert, the Patron Saint of the North, like those who went before us. I then suggested we stage a club relay run with a coffin – this received a less than enthusiastic response. Off we went from the Church, under the A167, following part of the Riverside parkrun route, then across the River Wear towards the field edges and a lovely climb up to Great Lumley. 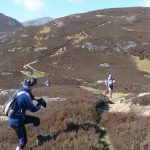 Luck and fair weather were on our side as the conditions were favourable compared to the slip-slide of the last Striders’ run on this route. Having paused at the top to admire the views, we processed on to Finchale Priory and to more familiar ground – HMP Frankland, continuing down to Durham (at this point folk seemed to rejoice in the downhill opportunity). Following the exact Cuddy’s Corse route, we crossed Framwellgate Bridge and startled shoppers as we climbed Silver Street and up to the Cathedral – job done and well done all! Nigel has taken a lovely set of photos from the weekend available via the link below, or click on any of the images to be taken to the gallery. 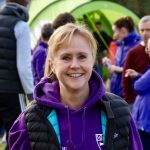 At first I thought this a ridiculous concept – run 5 x 1K laps around a pub, drink a half of beer after each lap plus a disgusting “snack” or canapé – I’m a Celebrity style – and then down a pint after the final lap. Apparently, such events occur all over the country – mainly as a fun way of raising funds for charity. And this is exactly what the Beer Belly Run was all about. The Grey Horse pub in Consett has been supporting the fundraising for Parkinson’s UK, organised by Ian Pratt of Blackhill Bounders since early this year after a local teacher was diagnosed with the condition. This was the latest event and Paul & I decided to enter – and run in fancy dress which was “positively encouraged” on the entry form. 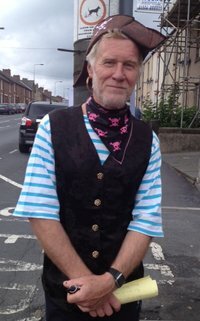 We turned up at the pub yesterday – a St Trinian’s schoolgirl and a pirate – for the 3pm start. There were 3 Elvis impersonators running, a gangster and his moll, Batman and a fat bloke dressed as a baby to mention just a few of the costumes. There were also quite a few Blackhill Bounders who clearly meant business! Some of them had disappeared for a half hour warm up session – and then there was the “pre-race stretching”. A mystery to most of the spectators! 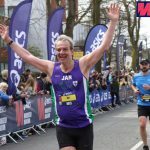 So we set off at a leisurely pace – Paul & I were running together! Hampered by a hockey stick and a boater that kept blowing off, I think I slowed things down a bit but then it wasn’t really about the time. First lap done and the half to down and the “snack” to face – drivers (me) and “schoolgirls” (also me) were excused the half pint – not the snack – but had to do a 10 second penalty. Well, by the time Paul had drunk his half the 10 seconds were well over! 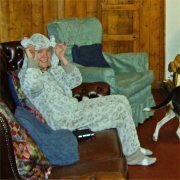 And so it continued until we finished and the landlady gave me a well-earned glass of wine. 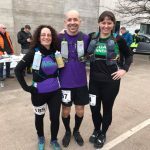 The fasted male was a Blackhill Bounder in 21 minutes, his wife was fastest female and oddly enough the fastest team was also the ‘warming up’ brigade from Blackhill Bounders. There are no ‘results’ or times but it was a great afternoon. 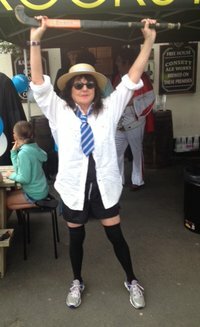 £757 was raised for Parkinson’s on the day. The Rag Pickers band played to entertain the troops all afternoon and they were fantastic – they even did a lap playing their instruments. 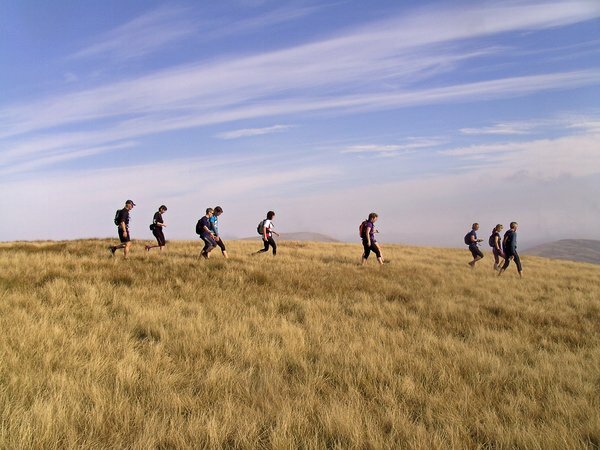 Ian Pratt tells me that Blackhill Bounders might put out a challenge to Elvet Striders for next year’s team event … so if you’re interested in a really good day out you might consider getting a team together. Five runners to run 1 leg each! More good crack after that, then Sunday brought a now-traditional climb through the ‘Clouds’ (i.e. 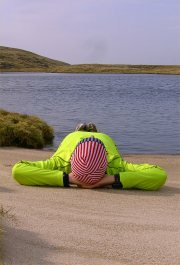 limestone pavements) and on up to Wild Boar Fell in balmy conditions. After a rest on the beach at Sand Tarn, we reached the top, with earily atmospheric views across the Mallerstang valley, through cloud and sun. 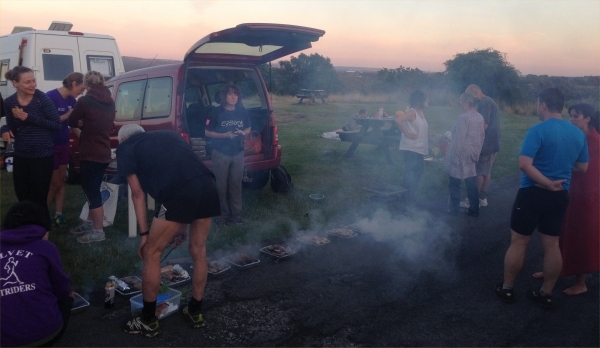 Then down the hillside for bacon, eggs and beans, helpfully cooked by Mandy this time, standing in for our usual chef, this year sadly elsewhere. Great stuff … so many thanks, Nigel, for once again doing the honours. Here are a few more of his excellent photos for a taste of proceedings … see link below for the full set. 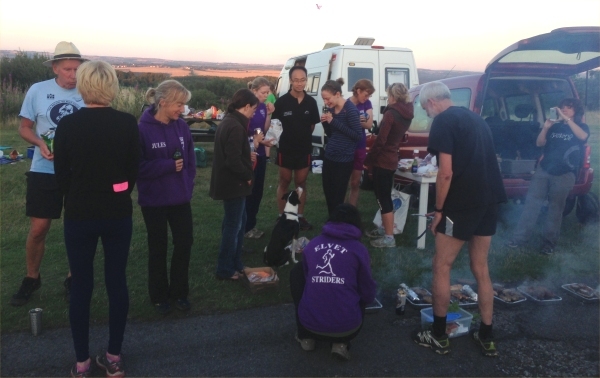 As part of the continuing fantastic summer weather, the club run took place in beautiful sunshine, which lasted until the end of the night, so things couldn’t have been better for the crowd of sweaty runners, charred meat, smoked veg and fruit eaters, friends, family and dogs who stood chatting around the BBQs until after 10 p.m. The run followed a meandering route for an hour, taking in a mixture of clear paths, head-high ferns, viscious nettles and brambles, a few hard hills, several bridges and two cooldowns paddling across streams. Because of the heavy rain on Monday several sections were overgrown, very green and lush. 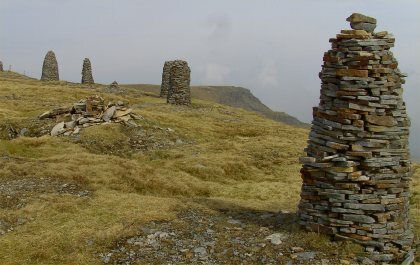 As ever, folk new to the fell were amazed it is there and said they never knew about it, some veterans of several such runs still said they didn’t have a clue where we were or where we went to. Susan and Geoff said it should be listed for extra Harrier League training sessions. After the run a sumptuous supper of great variety was produced. Alister won the prize for eating the most burgers, Danny definitely ate the most food, Jules had the fattest sausage, Mike the stumpiest carrot and Mandy the biggest corn cob. Most impressive veggie delight had to be Carolin’s kebabs. As ever, Angela drank the most tea. The barn was as good as last time, as was the crack and the food on the Friday night. 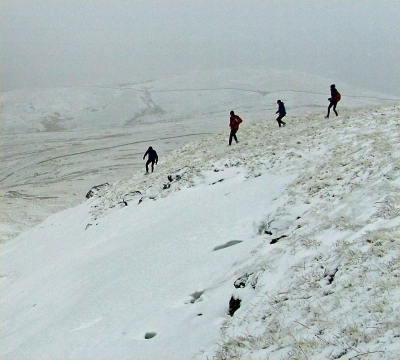 We had two running groups heading off onto the fells in epic snowy and windy conditions on the Saturday, plus walkers doing their own thing – also Jan doing the Dentdale Run. After the best part of five hours on the hills, we were ready for a spot of leisurely rugby-watching in the pub in Ravenstonedale, with good beer and food and more crack back in the barn. Sunday brought a bitter chill to the wind, but amazingly by five past nine we were all outside again and heading out for the top of Great Boar Fell. More snow and ice, also great views, before the weather closed in and we legged it back down the hillside for bacon, sausage, eggs, toast … all of which were very welcome. Great stuff … so many thanks once again, Nigel, for making this all happen. Many thanks to Pam and Paul for organising a great run and walk on Sunday! 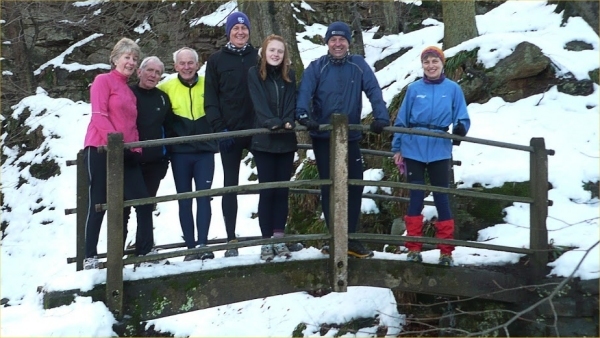 Twenty or so Striders and guests turned up at the car park in Allensford, which somehow managed to be both icy and slushy … a sign of things to come. Paul Foster lead us along a beck to the west, coming quickly to a bridge for an early photo-shoot, and a view of a waterfall, swollen with melt-water. Then we climbed through fields, then made our way along a country lane in complete flood. 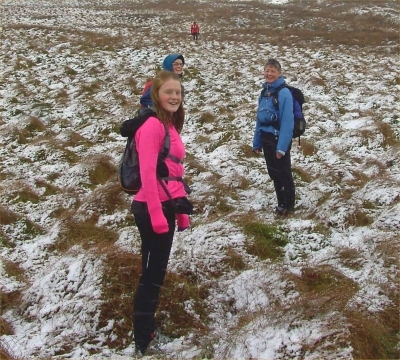 Cold freezing feet all round now … luckily the rest of the route wasn’t quite so soggy. 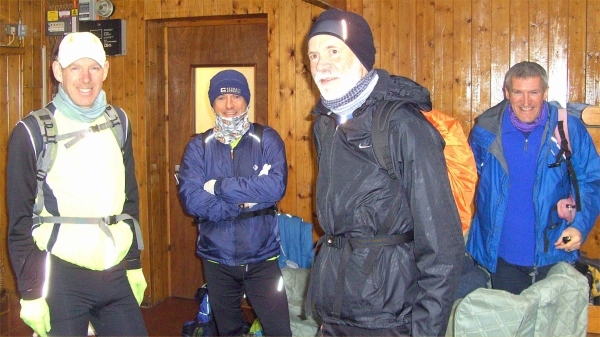 As we got onto the C2C to head back east towards Rowley, we had the choice of foot-deep snow to run in, or rutted wet tracks through the stuff – I opted for lots of knee-exercise, for the most part, which kept the feet dry, and the sweat flowing. On now to the Hownsgill Viaduct, and great views in bright sunshine for miles. This Victorian edifice is being fitted out with anti-suicide fencing, that to my mind will not improve it’s looks one bit … and, I suspect not deter the more enterprising, get-up-and-go type of suicider anyway! 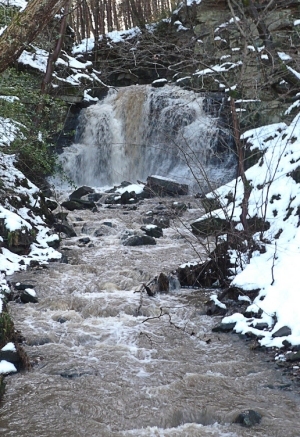 Lovely snowy descent back to the River Derwent and a riverbank return to Allensford. Eight miles, but the best part of two hours running through all the snow. 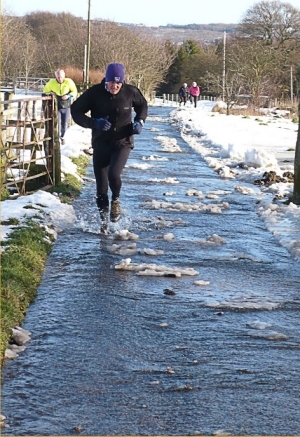 Many thanks, Paul – an epic run in those conditions. 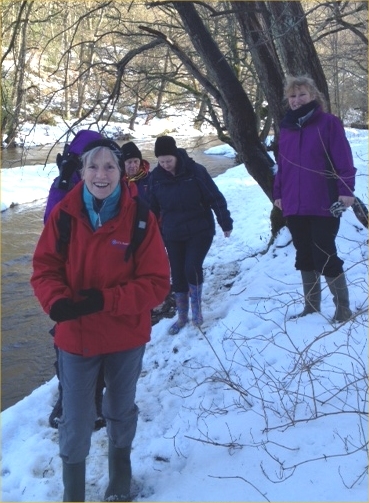 Pam lead a lovely walk in the Derwent Valley at the same time as the run. Then off to the Punch Bowl at Edmondbyers for a great lunch, washed down by a choice of excellent beers. A Sunday well-spent! Any more Sunday Run possibilities, folks? Twenty runners/walkers turned up on a bright but chilly morning. 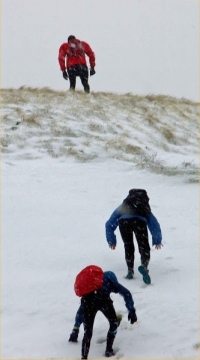 Sadly the car park proved to be more difficult than the previous day – firm snow had transformed into slippery mounds of very skiddy stuff. But we managed and set off. 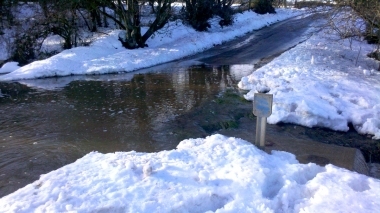 The river banks were soft, slushy and slippery in parts but the main feature (hazard?) 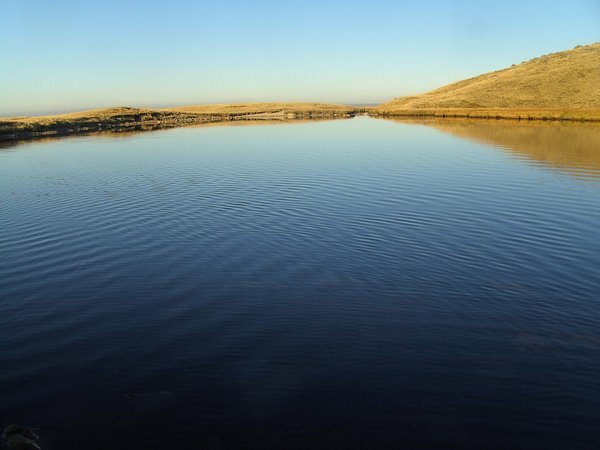 of the day was flooding – of varying depths and difficulty. At one point the bank was being submerged by the rapidly expanding river so we had to dodge around a tree to avoid it. Then there was a dash through a ‘lake’ to cross the stile in a field and finally a farm track which had become a mini stream! Various ‘river crossing’ techniques were applied while others looked on in amazement (amusement?). However, it was a bright sunny day, the views were spectacular and we just had such a laugh. Eventually we all arrived at the Punch Bowl for an excellent lunch. ‘Man of the Match’ for me was Till who managed to run 19+ miles from Durham straight to the pub – and still arrived before the rest of us! Amazing! I’d just like to thank everyone who braved the conditions for what was a really enjoyable day. 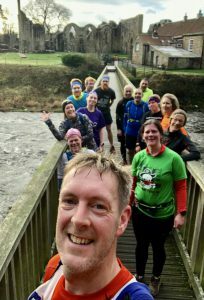 The Striders social run, combined with a Sunday lunch in Edmundbyers, looked like an excellent opportunity for a long run into previously uncharted territories. After the thawing and freezing of the past few days had turned the soft snow cover on the railway lines into an icy obstacle course, I decided to swap the trail shoes for a pair of normal running shoes, and hit the roads instead. I left Durham heading east on the A691, through Witton Gilbert and towards Lanchester. The cycle lane turned out to be impassable, and the right side of the road littered with puddles and running water, so I kept to the left side – not recommended on a weekday, but on this Sunday morning, there was very little in the way of traffic (perhaps Andy Murray had something to do with it?). In Lanchester, I left the A road, and after a short detour, turned left onto quiet Newbiggin Lane. I crossed the railway line, only to confirm my earlier decision, and headed straight west. On the climb towards Humber Hill Lane, the going got considerably more difficult, as water was streaming down towards me. However, reaching the crest, I was more than compensated for wet feet by spectacular views of the snow covered countryside. I turned right when I reached Longedge Lane, and right again to join the A68 towards Castleside. From here, the road descended steeply towards Allensford and the River Derwent, only to rise again equally steeply on the other side. I took the climb very slowly, navigating frequent puddles and looking out for occasional cars. Upon spotting the Derwent Reservoir in the distance, I took a left turn at Caterway Heads, onto the B6278. 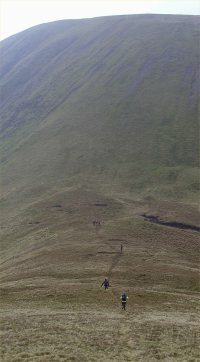 Another fast descent was followed by a gradual climb towards Edmundbyers, where I quickly spotted the Fruit Bowl [ Very close! Ed. ], and was soon joined by other Striders. A well-deserved pint or two, and delicious (vegetarian) lunch in great company followed. Special thanks go to Shaun, who lent me a warm fleece, to Pam who organised the event, and to Jan who gave me a lift back to Durham! For the record: 32.5 km (19.6 mi) with 486 m (1594 ft) climbed in 2:46.